What Was the Relationship Between the Korean Provisional Government and Christianity? On the occasion of the 100th founding anniversary of the Provisional Government of the Republic of Korea, an event was held to look back at the role of Christianity in that government. SaRang Church (Rev. 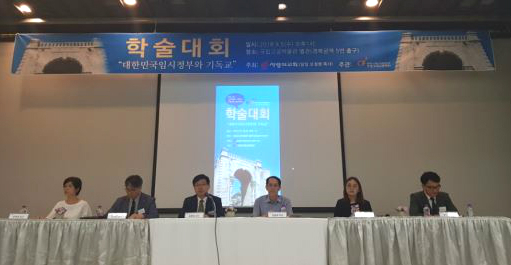 Oh Jung-hyun) held an academic conference (photo) titled “The Korean Provisional Government and Christianity,” on September 5 at the National Palace Museum of Korea in Jongno-gu, Seoul. At the conference it was also clarified that the majority of figures in the united Provisional Government were Christians. According to the Korea China Foundation, which supervised the conference, there were six Christians among the nine leaders of government following its consolidation. Starting with top leaders Lee Dong-hwi as prime minister and Rhee Syngman in charge as president, Lee Dong-hwi, Kim Kyu-shik and other key Independence Movement activists held significant positions. Other presentations followed. Yonsei University Prof. Kim Myeong-seop analyzed the reason for the Provisional Government’s location in the former French concession of Shanghai, saying that it was due to the international situation at the time, including the outbreak of World War I. Soongsil University Prof. Kim Myeong-bae described the role played by “Christian nationalists” in the process of the March First Movement and the establishment of the Provisional Government. Honam Theological University and Seminary Prof. Choi Sang-do and Seoul Theological University Prof. Park Myeong-su reilluminated the roles of Christian Independence Movement activists in Korea and the United States.